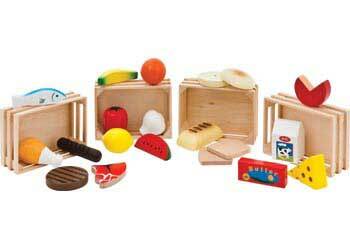 This wooden play food features the five food groups. Includes food such as watermelon, milk, bread, chicken and tomato (20 pieces in total). Each piece is made from solid wood, and includes 4 wooden crates for sorting and storage. An excellent resource for role play, categorising, counting and learning about healthy nutrition and the food groups. The wooden crates each measure 11 x 16 x 5.5h cm. Suitable for children from 3 years of age. Role play helps children to develop language and communication skills. It develops and promotes creativity and imagination. Dramatic and imaginative play also encourages children to become more confident and develop a stronger sense of identity. When children come together in role play, it aids in their social and emotional development. Listening to others, negotiation and co-operation all result from authentic dramatic play. This resource is excellent for promoting social and imaginative play. Role play and dramatic play encourages language development, teaches daily routines and skills plus develops social interactions, sharing and a sense of belonging and identity. Play is an important part of early childhood. Play encourages children to learn, develop and grow whilst they have fun. 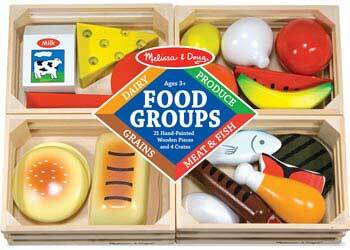 Melissa & Doug is one of the leading designers and manufacturers of educational toys and children's products. Started in 1988 in their garage, Melissa and Doug has something for everyone, with unique and exciting products for children of all ages. Thanks to the Melissa & Doug's hand crafted designs and use of durable wood and other specialist materials, the range continues to have strong appeal to educators, parents and children. Their range of products vary from art and craft, to puzzles, dress up costumes, games and role play resources and accessories.